This rare flag is one of those special few that truly have a random arrangement of stars that defies all attempts to find a coherent underlying geometric pattern. The positioning of the freely rotating stars is visually striking, producing voids and chains that lead the eye in various directions across the canton. When flown, this beautiful flag must have been intriguing to observers. While it waved in the breeze, one can imagine people gazing up at it and desperately attempting to discern some recognizable pattern, though none would be apparent. The perception of motion of the stars, the actual motion of the stars, and the rotation of the stars along their various axis would have added an overall impression of a random, twinkling constellation. What inspired such a design for this flag is not known for certain, but interestingly, printed materials of the day, such as the covers of patriotic sheet music or patriotic cover envelopes, often featured random stars to give the impression of motion. Perhaps these motifs were the inspiration for such a design for this flag, though we will never know for certain. The cotton stars of the flag are sewn with a treadle machine in with stitches crossing the stars, an unusual trait for early sewn flags from this period in which the stars are typically hand sewn. The stripes are made of wool bunting, and overall the construction indicates a cottage-industry manufacturer produced the flag, rather than being of homemade design. Yet the uniqueness of the canton would be surprising for a manufactured flag, adding to the intrigue of the flag. 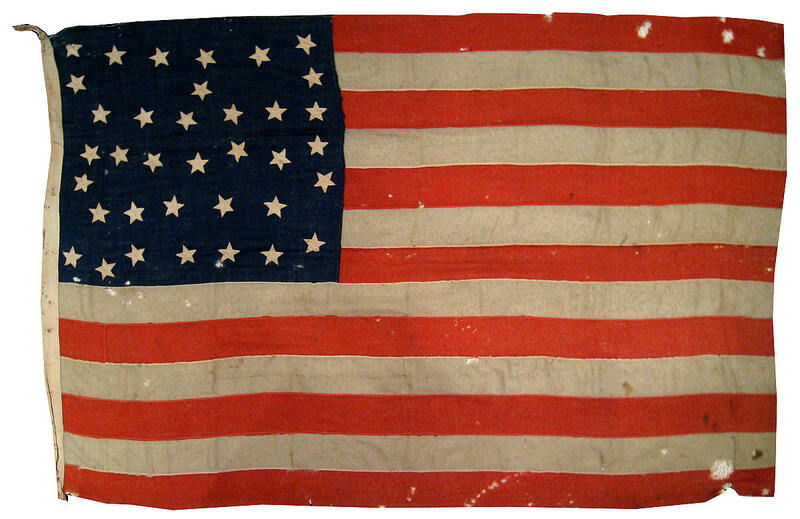 What is known is that the flag originally belonged to Civil War Veteran either, Edward A. Packer, Henry W. Packer, or John O. Packer of Litchfield, Michigan. The flag was obtained from a Michigan Packer family member, and is a unique treasure of American Flag design.